My new office has a cool mix of people, 3 architects, 2 product designers, 1 web designer and me. The product design guys just got a 3D printer (!) 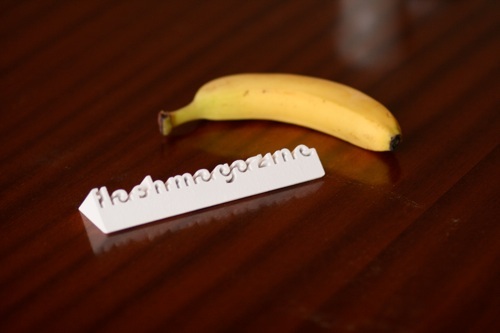 and I just had to try it out using the Flashmagazine logo! More pictures of the process on Flickr. It’s just insane. With a printer like this, you can make anything! Gizmondo quotes a new survey that claims that OSX now accounts for 7.31% of all OS’s. For now it looks as MS is still asleep dreaming of Vista. Odd, isn’t it? They really don’t see Apple as competition, do they? I just saw Scott post about a project that I’ve followed with great interest, the OLPC. Originally dubbed the $100 laptop, the cost is currently about $200 per machine. I assume that the price will lower as the number of machines produced go up. To boost this process the people behind started a campaign where by giving one, you can also get one yourself. The basic idea is to offer low priced computers to developing countries. What I see as the single biggest thing coming out of this is Knowledge. The information available on the web is massive. These machines can really help giving under-developed places opportunities they’d never have and improve a lot of lives. The OLPC website has very limited info, but for those interested, I recommend checking out the Google TechTalks video where the project was presented. It’s a little long, but this machine is totally cutting edge in all the ways it saves power and connects. Well worth checking out! Unfortunately, anyone outside the US/Canada cannot donate for now. I also noticed something really cool, T-Mobile are giving away a full years hotspot access to anyone contributing! Really nice of them, even though it can be considered marketing. I spend maybe $50-$100 on random T-Mobile access per year, so it could actually reduce the price of giving in my case. Do you know what you’re paying for? Check this article by my buddy Jarle Bergersen. Initially, the adsense /adwords system provided by Google was simply amazing. Since the text ads were displayed based on the contents of every page, they were always relevant and they usually showed up on the right sites. Click-rates were astounding when I first implemented Google ads on Flashmagazine 4 years ago, somewhere between 3-4%. Numbers like these were pretty rare in the industry back then and they’ve been falling steadily ever since. Now the clickrate is about 1,5% and it looks like the folks running adsense /adwords have gotten despearate to improve the situation. Using Google, you can’t really decide where your ads show up. Google will try to locate the best place for your ad and up until now they’ve done a decent job. With the introduction of Adsense for Domains, they are now allowing domain pirates and others that don’t provide value to get a bit of your advertising budget and there is no way you can prevent it (Norwegian version). To me, it looks like Google is loosing it’s touch? Up until now, they’ve always done what is best for the end user/advertiser, but this time it’s apparently only about money? Just gotta blog this for future reference. I keep getting requests from friends that are looking for a simple way to set up a small webshop and I found this - Bigcartel - a really simple solution that you can have up and running in next to no time. They offer a free solution that you can test just for fun, and a subscription version with some useful features. They only offer PayPal, but that’s more than enough for simple use. Anyone can set this up. Found it via this neat site where you can get “Apollo bootleg t-shirts”. Ever since I switched to Mac about a year ago, I’ve been sure that the Intel Macs and OSX would become serious competition for Microsoft. According to thecounter.com, Mac users now account for almost 4,3% of all their visitors (72.993.015 person user sample thus far this month). I’m not saying that the figures from thecounter.com are 100% representative. They are based on info from a small JS that is loaded on all of internet.com’s sites, so it’s a tech-based audience, but still it’s very interesting to see how steadily the number of Mac users grow. Two years ago, mac users were only 2%. I seem to remember that Gartner Research predicted late 2006 that Mac’s wouldn’t get above 2.9% in 2007? Fun to see how analysts fail to really research the market. Just imagine the rush that will come now that Adobe finally has delivered CS3 on the Intel Mac platform. I bet they forgot to think about how that will affect Mac growth? Another fun fact - the project I’ve been working on the last year has seen insane Mac growth. Initially, only two of the coders had Macs in the building. Now it’s about 20 of us doing Flash, HTML and Java on shiny new Intel Macs. I’m pretty sure that OSX will have near 6% market share by the end of this year, driven by iPod and iPhone sales. This summer, I’ve been to Sydney for my brothers wedding. What a great city! I’m definetly going down again to the next MXDU conference sometime in March. While there, I wandered around Sydney’s Chinatown and picked up the best DVD box I’ve ever seen: “The Studio Ghibli Collection” (17 DVDs!). Ghibli is often called the “Disney of the East”, but I’d say they are way better than that. Disney have become so commercial that they only make boring movies that they know will make them money. It’s years since Disney innovated story-wise and I stopped buying Disney a long time ago (except for the Pixar ones). Disney movies are not “magic” to me any more, but the Ghibli movies sure are. Their stories are inventive, gripping, odd, magical and both adults and kids love them. If you like animation and don’t know the movies from this studio, you should definetly check them out. If you already love Ghibli, this is the box to get! It contains all the 15 feature movies produced by Ghibli and Hayao Miyazaki, including Howls Castle, The Cat Returns, Spirited Away, Kiki’s Delivery Service, Princess Mononoke, Castle in the Sky and my alltime favourite animated movie My Neighbor Totoro. 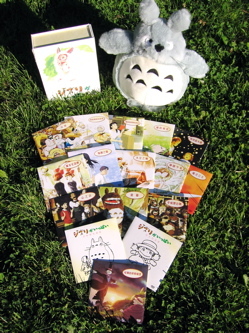 The box also contains a big plush toy Totero and two special discs. The first of these contains a lot of short movies and advertising produced by the studio (including some fascinating shorts made for Yamaha). The second contains artwork and other extras. I had ten of the movies already, but the rest was really hard to get hold of. I payed just 165 australian dollars for the whole box and it’s worth every cent! Since my first Wintel PC, I’ve used Norton’s various Utilities for maintenance and antivirus. Not any more. Last week I read a post by Stephanie at CMXtraneous saying “Is Apple getting too big”. Appears that Symantec has the same problem. They’ve become so big and have automated so many tasks that they’re not able to support their users. Two weeks ago, my Norton Antivirus subscription came to an end so I clicked the renew-link and bought a new subscription. When the process was finished, I tried to paste the subscription code into the software and I got a message saying it was invalid. So I read all the FAQ’s and info I could find but couldn’t really figure out what the problem was. Every request to Symantec support takes 2-3 days and they never really look into your case or read the former messages you’ve sent. They just send you the same old links that will not fix the problem. After two weeks mailing back and forth with either humans or dumb auto-responders at Symantec.com I figured that the link from within the program had sent me to a wrong page. I had accidentally bought a renewal for Norton Antivius only, not Norton Internet Security as I had installed. It sort of explains why it didn’t work, but this was after all the product that Symantec themself linked to and recommended I’d buy. I trust them with the security of my computer, so why should I not trust them to be able to sell me the right subscription? Anyway - tonight I’ve uninstalled all Norton software and tried installing the version I supposedly have a lisence for, but to no vain. After 7 (!) restarts to get all the updates with LiveUpdate, it still won’t accept the CD Key I purchased. Guess I’ll try AVG now. They offer a free version for home users and a way better 2 year subscription deal than Symantec. A friend of mine has recommended AVG on several occasions and says they do a better job of protecting the machine while not slowing it down as much as Norton does.